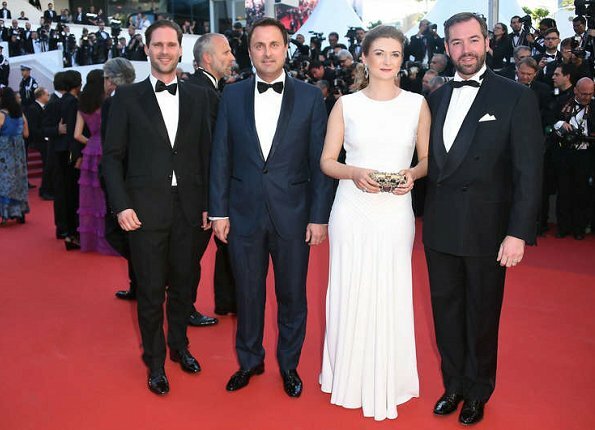 Hereditary Grand Duke Guillaume and Hereditary Grand Duchess Stephanie came to Cannes in South of France and attended the opening night of 70th Cannes Film Festival on May 17, 2017. 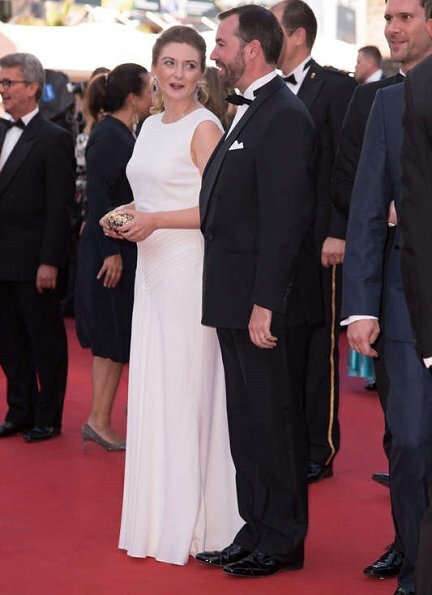 Princess Stephanie wore a white dress by Ralph Lauren at the opening night of Cannes Film Festival. 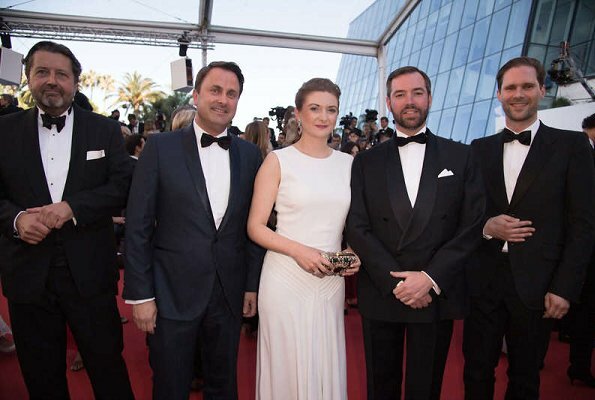 The same dress had been worn by Crown Princess Victoria at Polar Music Prize ceremony in 2016. Oh my 💕💕 she looks lovely! LOOK AT THE EARRINGS! Well done HGD! Oh! Just lovely! But then I like Stephanie whatever she has on. She is my favorite royal! WOW STUNNING!!! She is very beautiful, very stylish and sophisticated. What a beautiful dress. Whoa! I cannot wait to see everyone's comments! I am really enjoying her fashion awakening! I want her clutch and earrings! Nice! Just wow - that's it. Absolutely stunning from her head to her toes!!! Her hair is gorgeous, knock out earrings, and a chic, simply styled gown!!!! You go girl!!!!! My God, that's fantastic! Stephanie looks wonderful in this long white dress, her hairdo is very beautiful and both are confident. Glad too see that! Lovely - simple, elegant dress that allows her to up the ante with her jewellery and hair. The earrings are wonderful. She looks amazing. I'm convinced too lol, she went from drab to fab! 😄😄😄then I hope she reads that we noticed and brings us more royal fashion!! Oh wow! Stephanie looks fabulous. What a transformation ! In a word stunning! 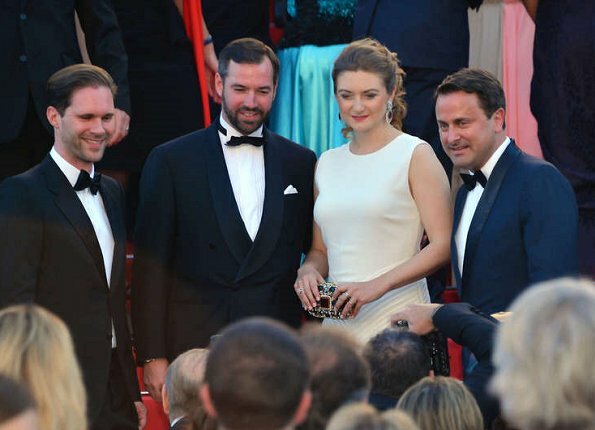 The look of a Hereditary Grand Duchess. Bravo, Stephanie - and Bravo Guillaume. Stephanie looks lovely in that Ralph Lauren gown. Lauren is one of my favorite designers, and it is wonderful that Stephanie has discovered his designs! Who would have thought that Stephanie would look as good as Victoria in the same dress? Amazing! Yes, who would have thought of that :) TBH I liked Stehpanie's styling even better than Victoria's (Victoria wore something weird on her shoulders and it ruined this lovely dress). 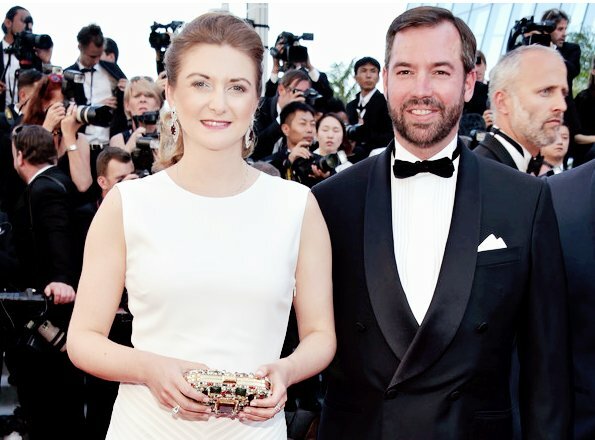 It seems CP Victoria always stretches herself for the polar prize red carpet and I love that-even wore her hair (almost) completely down once😲 But Stephanie styled this gown supremely and it is better! Wonderful! Elegant, beautiful dress, lovely hair, smiling and confident! I just cannot get over the change in the last week or so w Stephanie. It is just so wonderful! I have always thought she could give Catherine and Mary a run for their money. I love seeing her like this! This IS A ROYAL! She looks indeed very good here. But it's still too early to say "this is a royal". Until now she has only proven that she can dress the part, let's wait and see if she will ever act the part. When it comes to serious humanitarian commitment she is lightyears behind her colleagues as she has only done fun and pleasure events so far. Diane, don't you worry, please write another comment if you like - we understand you because we all are over excited for Stephanies awakening in all areas: clothes, confidence and inner happiness. You said it. Stunning--in the best way! At last! I hope she will burn all that old stuff that she shouldn't wear again. Yes! @K I do also! Belle... No words. ELEGANT, ROYAL... KEEP IT UP PRINCESS. Cette fois-ci, elle est tout simplement époustouflante! Un sans faute sur toute la ligne. Sa coiffure, ses boucles d'oreilles, son sac, tout tout est parfait. 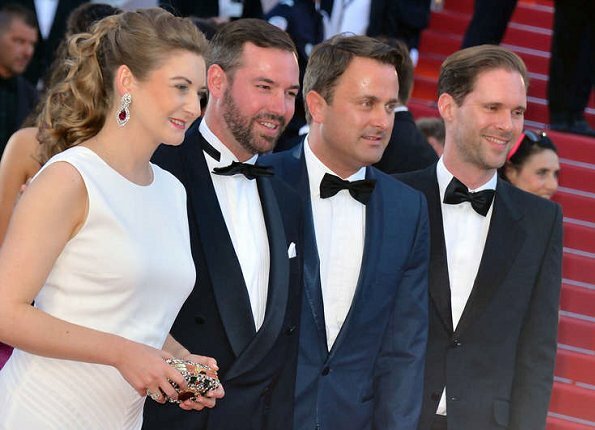 Bravo Grande Duchesse héritière Stéphanie! Tout à fait ! 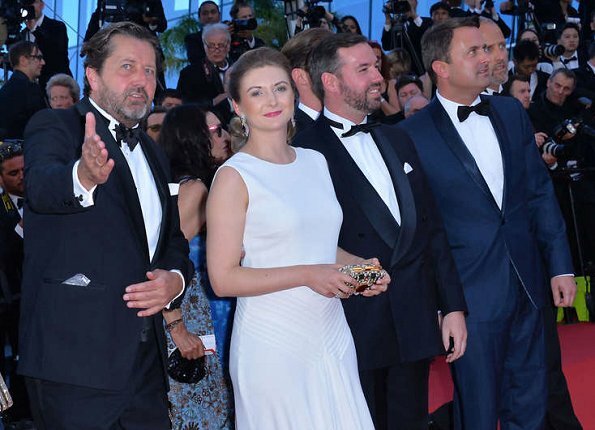 J'espère que quelqu'un au Palais lui transmet nos commentaires extatiques, afin de l'encourager à poursuivre sur sa lancée (okay, je rêve un peu...). She is so elegant. Her hairdo is very beautiful.The earrings are great. And that simple white dress In a word, WOW! Two thumps up from me! Gorgeous look. Stephanie used to wear clothes that looked drab and uninteresting. Now it looks like she's been transformed into a beautiful and elegant swan. Whatever she's doing, continue doing it. She's so much fun to watch these days. We really appreciate this transformation! Head to toe perfection! Love Stephanie's hair, those earrings (wow!) that gorgeous gown and clutch, sheer perfection (I have to say it again), this is one of the best gala looks I have ever seen (from anyone). I could wax lyrical about everything Stephanie's is wearing here. I love every aspect! Beautiful dress on decent, sofisticated person. It is true she got a really good stylist finally !!!! Wonderful Stephanie !!!! She has such a sweet face, I'm sure she is a lovely person to know. The best I have ever seen her. As nice as it looks all together, the dress doesn't fit properly around her right shoulder and armpit. There is a bulge and her bra strap is clearly showing, not very classy IMHO. I will never understand why she is completely unable to have her clothes fitted by a decent tailor or seamstress with all that money at her hands. First reaction, wow ! This is a total transformation for Stephanie! She even looks happier ! She certainly looks exquisitely put together. Love the earings, and the clutch, just enough sparkle to do justice to the gown. She looks just STUNNING! That white dress is right in every way, earrings are to kill for and hair nicely done. Now that Stephanie has given us so many great looks, she can not go back to her old clothes. She looks great! I really hope she did hire a stylist, and that she keeps whomever it is. Her mother died just before her wedding. I imagine that it may be hard to cope with motherhood while mourning one's mother. And maybe she wants to get used to her new life a bit first. She is still young, she does not need to hurry these things. Is like seeing your kids grow up, isn't it? I have been following the blog ( and every ugly trouser outfit) and usually don't comment, but this one beings anyone out of anonymity. Well done Stephanie. She looks beautiful. Average Girl you are so right. She was before wasting so much potential. It really feels like we have made ourselves this change. LOL And are now proud of our child managing. Whys is a baby missing? they both look happy, maybe they want to extend their honeymoon without babies for now, it's their business. She looks great, and everybody agrees about except for, of course, Romana.